In an unusual observation, astronomers used the National Science Foundation's Very Long Baseline Array (VLBA) to study the effects on radio waves coming from a distant radio galaxy when an asteroid in our Solar System passed in front of the galaxy. The observation allowed them to measure the size of the asteroid, gain new information about its shape, and greatly improve the accuracy with which its orbital path can be calculated. When the asteroid passed in front of the galaxy, radio waves coming from the galaxy were slightly bent around the asteroid's edge, in a process called diffraction. As these waves interacted with each other, they produced a circular pattern of stronger and weaker waves, similar to the patterns of bright and dark circles produced in terrestrial laboratory experiments with light waves. "By analyzing the patterns of the diffracted radio waves during this event, we were able to learn much about the asteroid, including its size and precise position, and to get some valuable clues about its shape," said Jorma Harju, of the University of Helsinki in Finland. The asteroid, named Palma, is in the main asteroid belt between Mars and Jupiter. Discovered in 1893 by French astronomer Auguste Charlois, Palma completes an orbit around the Sun every 5.59 years. On May 15, 2017, it obscured the radio waves from a galaxy called 0141+268 with the radio shadow tracing a path running roughly southwest to northeast, crossing the VLBA station at Brewster, Washington. The shadow sped across the Earth's surface at 32 miles per second. In addition to the VLBA's Brewster antenna, the astronomers also used VLBA antennas in California, Texas, Arizona, and New Mexico. The passage of the asteroid in front of the radio galaxy, an event called an occultation, affected the characteristics of the signals received at Brewster when combined with those from each of the other antennas. Astronomers, both amateur and professional, commonly observe asteroid occultations of stars, and record the change in brightness, or intensity, of the star's light as the asteroid passes in front of it. The VLBA observation is unique because it also allowed the astronomers to measure the amount by which the peaks of the waves were displaced by the diffraction, an effect called a phase shift. "This allowed us to constrain the shape of Palma with a single, short measurement," said Leonid Petrov, affiliated with the Geodesy and Geophysics Lab, NASA Goddard Space Flight Center. 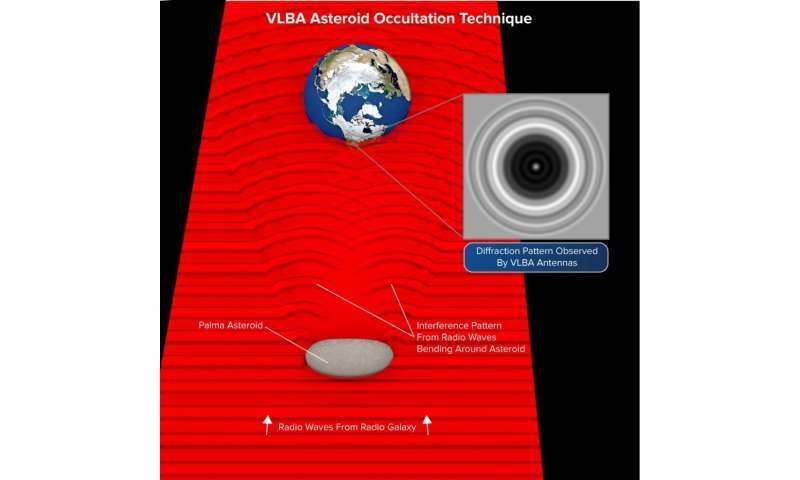 "Observing an asteroid occultation using the VLBA turned out to be an extremely powerful method for asteroid sizing. In addition, such radio data would immediately reveal peculiar shapes or binary companions. That means that these techniques will undoubtedly be used for future asteroid studies," said Kimmo Lehtinen, of the Finnish Geospatial Research Institute, in Masala, Finland. One major result from the observation was to improve the precision with which the asteroid's orbit can be calculated. "Although Palma's position has been measured more than 1,600 times over the past 120 years, this one VLBA measurement reduced the uncertainty in the calculated orbit by a factor of 10," said Mikael Granvik, of Lulea University of Technology in Sweden and the University of Helsinki, Finland. "This is a rather unusual use for the VLBA, and it demonstrates that the VLBA's excellent technical capabilities, along with its great flexibility as a research tool, can contribute in even some unexpected ways to many fields of astronomy," said Jonathan Romney of the Long Baseline Observatory, which operates the VLBA. I am amazed when I consider how many scientific achievements have been the products of accidents. And the genius was in recognizing that something is worth further research. That those of us with more limited vision would disregard as not being within the instructions given us for our assigned task. Not an accident as much as clever use of equipment to study an asteroid. I have to wonder how hard it is to be aware of upcoming occultation events of interest? There's a whole lot of objects out there that can be occultated by a whole lot of other objects. Is there a database that one can query? For example, can one ask for asteroid occultations of radio objects that will affect a set of observatories in the next 5 years? We provide predictions of occultations of stars by asteroids and the Moon, and of grazing occultations of stars by the mountains of the Moon's north and south polar regions. By observing and timing occultations, amateurs have contributed to the discovery of new double stars, improved knowledge of the shape and orbits of hundreds of asteroids and helped map the Lunar polar regions.